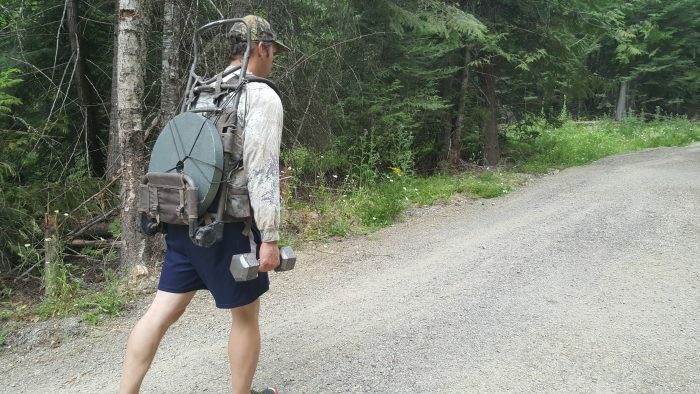 Elk Season Workouts – Who Needs ‘Em? Elk hunting can be the most grueling way to spend time in the Montana mountains. Steep hills, rocky slopes and blown down trees all take their toll on hunters. Getting in shape pre-season will help you go where you need to be on day one. If you’re a hunter you probably already own a frame pack of some sort. Strapping a heavy plate on the back and grabbing something heavy will get you started. Don’t have weights? Fill a sack with dirt and grab two milk jugs filled with water. It doesn’t take hours and hours to get in shape. Find a slope nearby that’s 100-200 yards long and jog to the top, stretch and so it again. Increase your speed each time until you’ve completed 5 sets. Next hike to the highest point with weight on your back five times. It takes less than an hour 3 or 4 times per week to make a major difference in your hiking abilities. If you have issues with your knees hurting going down hill try adding water to a 5 gallon water jug and hiking to the top of a hill/mountain then dump the water out for the walk down. When you are done always do crunches or sit ups to keep your core strong. Find some way to spend a few hours each week from mid July until September stressing the muscles you’ll need – the better shape you are in on opening day the better your odds are for putting meat on the table this fall. There are a million ways to get into shape but only one way to make any of them work – You’ve got to go!